(Nanowerk News) Every hour, the sun floods Earth with more energy than the entire world consumes in a year. Yet solar power accounts for less than 0.002 percent of all electricity generated in the United States, primarily because photovoltaic cells remain expensive and relatively inefficient. But solar may not be such a marginal power source for long. Chemists at Idaho National Laboratory and Idaho State University have invented a way to manufacture highly precise, uniform nanoparticles to order. The technology, Precision Nanoparticles, has the potential to vastly improve the solar cell and further spur the growing nanotechnology revolution. Nanoparticles are motes of matter tens of thousands of times smaller than the width of a human hair. Because they're so small, a large percentage of nanoparticles' atoms reside on their surfaces rather than in their interiors. This means surface interactions dominate nanoparticle behavior. And, for this reason, they often have different characteristics and properties than larger chunks of the same material. While scientists have just begun to exploit nanoparticles, they already show great promise in a number of fields, from medicine to manufacturing to energy. For example, embedding certain nanoparticle types in building materials makes structures stronger and more corrosion-resistant. And nano-engineered transistors are smaller, faster and more efficient than traditional ones. The chemists have manufactured nanoparticles of the semiconductor copper indium sulfide (identified here as “quantum dots”), a key component of advanced solar cells. "Nanoparticles are the scientific gold rush of the next generation," says INL chemist Bob Fox, who helped develop the Precision Nanoparticles technology. "They'll change our lives the way personal computers have." Because the properties of nanoparticles are so size-dependent, any little dimensional tweak can make a big difference. Thus a key to harnessing the potential of nanoparticles lies in the ability to produce them at certain prescribed sizes, with tiny margins of error. This capability has proven elusive, but it is just what Precision Nanoparticles delivers. A few years ago, Fox and ISU chemists Joshua Pak and Rene Rodriguez began looking for a better way to make semiconducting components for solar cells. Specifically, they wanted to improve how raw materials are transformed into semiconducting nanoparticles. The industry's established method of doing this is relatively imprecise and energy-intensive, requiring temperatures around 300 degrees Celsius. The team hit upon the idea of using "supercritical" carbon dioxide to streamline the reaction. Supercritical fluids are a bit like a mix between a gas and a liquid. They can diffuse through solids, for example, but also dissolve substances like a liquid does. Supercritical carbon dioxide has been used for years to decaffeinate coffee. But when Fox, Pak and Rodriguez introduced supercritical carbon dioxide into their reaction vessel, the only immediately noticeable result was a thick yellow goop. "We thought it was a failed experiment," Fox says. But when the chemists looked more closely, they discovered the goop was full of very small, incredibly uniform semiconducting nanoparticles. The same reaction, roughly, that industry uses to transform raw materials into semiconducting nanoparticles had taken place — but it generated a better, less variable product. "We didn't expect that doing this would give us such homogeneity," Fox says. "That was really exciting." And because the new reaction could proceed at a much lower temperature — 65 degrees Celsius rather than 300 — it also promised to save a great deal of money and energy. After tinkering with the reaction, Fox, Pak and Rodriguez figured out how to control nanoparticle size with unprecedented precision. They can now produce prescribed particles between 1 and 100 nanometers, hitting the mark every time with great accuracy. In July, R&D magazine recognized the breakthrough technology as one of its top 100 innovations of 2009 — a prestigious award commonly referred to as an "Oscar of invention". And in September, the work won the Early-Stage Innovation of the Year prize in the Stoel Rives Idaho Innovation Awards. Fox, Pak and Rodriguez have licensed the technology to Precision Nanoparticles, Inc. The relatively new Seattle company is poised to begin production of tailor-made nanoparticles for the photovoltaic industry. The aims of the INL and ISU chemists — and of Precision Nanoparticles, Inc. — are to make solar cells more efficient and, ultimately, solar energy more practical. In a solar cell, photons strike atoms of a semiconducting material — historically, silicon — knocking loose some electrons. These liberated electrons then flow in a single direction, generating direct-current electricity. The amount of energy needed to jar electrons loose is specific to each material and corresponds to only a tiny sliver of the sun's radiation spectrum. This fact explains why the efficiency of most current cells maxes out at around 20 percent. To knock an electron free from silicon, for example, an incoming photon must have an energy of about 1.3 electron volts. This energy is known as silicon's band gap, and it corresponds to a photon wavelength of 950 nanometers or so. Photons with lower energies — and thus longer wavelengths — won't do the job. Shorter-wavelength photons will, but their energy above 1.3 electron volts is wasted, dissipated as heat. This is a big deal, because the most abundant photons from sunlight occur between 500 and 600 nanometers (which our eyes register as greens and yellows) — meaning that most current photocells waste a lot of energy. Engineers have been working hard to harness more of the solar spectrum, to design cells that put low-energy photons to work and use high-energy photons more efficiently. 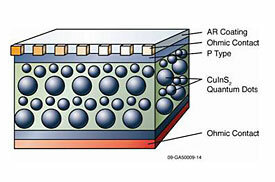 One way to do this is to build composite cells with layers of different semiconductors. Slapping a film of copper indium sulfide atop a band of silicon, say, increases a cell's photon-catching power. But building such devices is expensive and technologically tricky. "The different layers don't play well together," Fox says. That's where the Precision Nanoparticles technology comes in. One of the many properties that changes with a nanoparticle's size is its band gap. Because Fox and his team learned how to control nanoparticle dimensions so precisely, it may soon be possible to manufacture — from a single material — semiconductor building blocks tuned to specific wavelengths of light. A photovoltaic cell made of such building blocks could capture huge swathes of the solar energy spectrum. And since the cells would contain only a single semiconducting material, they would be much cheaper, more efficient and easier to construct than current multi-layer designs. Some cells' semiconductor nanoparticles, Fox believes, could even be tuned to pick up infrared wavelengths — heat, which radiates off rocks, buildings, roads and parking lots deep into the night. "So your solar panel could be working long after you've gone to bed," he says. While Precision Nanoparticles' most immediate applications come in the field of its birth, photovoltaics, potential uses don't stop there. For example, the technology could also greatly advance ultracapacitor research. Ultracapacitors store electrical energy quickly and effectively, and they may someday replace batteries in electric cars and plug-in hybrids. At least one material, vanadium nitride, has much higher ultracapacitance in nano-form — but only if the nanoparticles are of strictly uniform size, Fox says. To fully blossom, the nanotech revolution will require the control needed to produce such uniformity. Technologies like that developed by Fox, Pak and Rodriguez may be able to provide this control, delivering particles of predictable size with predictable properties. As a result, nanoparticles could find their way into more designs, and more products. "The only thing limiting us at this point is our imagination," Fox says.